Universal Fast Smart Charger is designed for charging any NiMH / NiCd Battery Pack from 9.6V - 18V, for 8 to 15 cells pack. 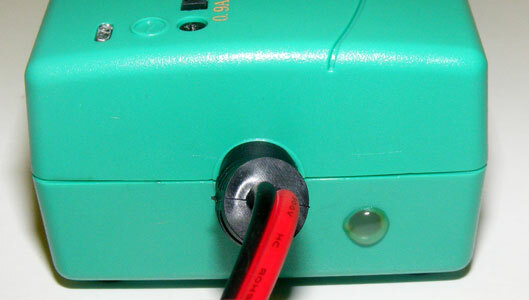 After connect AC power (without connect to battery), LED flashing red-green-red before charging to test the operation of the charger if ready to use. Short circuit protection: No output voltage from the charger if the battery is not connected. 120-240V AC input for worldwide use. Cut-off power automatically by negative delta V IC when battery pack is fully charge. Protect battery from over current, short circuit & reverse polarity. One temperature sensor outlet ( Male BEC connector) is installed with the charger to double protecting battery from overcharged. 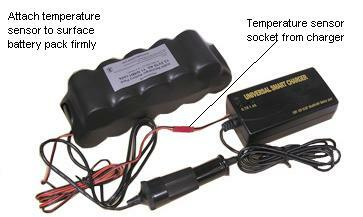 You must use temperature sensor to charge 12V or higher NiMH battery pack, except water bottle NiMh batteries. One cable with female Tamiya connector and two clips which allow you to connect a battery pack to the smart charger. 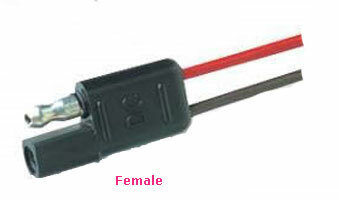 One connector adapter from standard male Tamiya to Mini female Tamiya for charging RC air battery packs. Part Number: CU-J303, 5.5 x 2.5mm Male barrel connector (Note: No thermistor on the charger). Barrel Connector inside is positive. 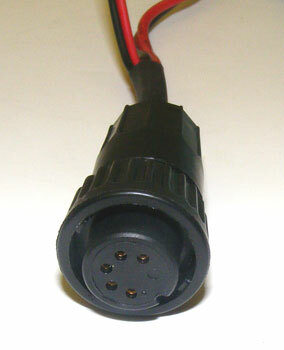 4.5' cable, designed for CU-J362 custom 12V Nimh battery pack. Barrel Connector inside is positive. 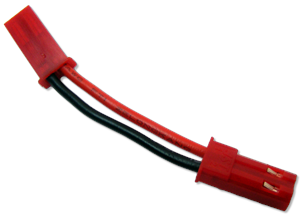 12" long wire, designed for CU-J707 custom 12V NiMh pack. 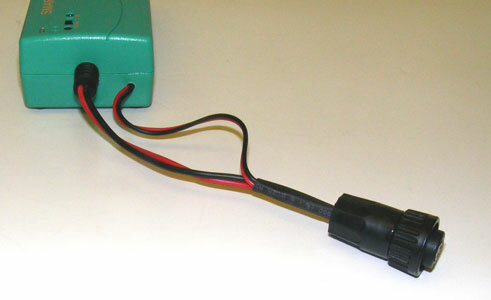 12" long wire, designed for CU-J584 custom 12V NiMh pack. (Note: No thermistor on the charger). Part Number: CU-CH127, 5.5 x 2.1mm Male barrel connector Barrel Connector inside is positive. One temperature sensor ( 70oc thermistor ) with BEC connector is included. Use for battery pack that does not have thermostat protection. It must be connect between battery charger and the battery pack before charging to protect battery from overcharging. It will cut-off power if battery temperature is over 70 oC. If you have question on what current setting to use, please check the battery specification to find out what is the maximum charging current before selecting the charging current. The charger is designed for indoor use only. The charger should be horizontally positioned and work in well ventilated condition, avoid moisture and keep it away from inflammable explosive goods. Ambient temperature shall not be more than 40 degreeo C when using the charger. I love that it is a Smart Charger. I'm tired of dumb chargers using too much electricity. Ive been a customer for a bout 10 years. I operate a small fleet of ultra LEVs na duse your NimH batteries for most of them. Excellent service. Great selection. Quality products as described on site. Quick delivery. Just placed another order #292352. Thanks Batteryspace for great products at reasonable prices. One of the items I purchased was temorarily out of stock at the time I completed my order, even though the web site seemed to indicate stock. The shipping of my order was delayed by around 4 days because of this. All other aspects of the purchase and products are fine. Overall pleased with the order. Got the products within a week. I would like to see them provide better status infromation on order (i.e. that it shipped with a tracking #). I followed up with an email to customer service asking for status and to there credit they responded quickly with the information.